I have just played with the Microsoft Publisher for journaling, and this has come up. I have tried playing with Corel photoshop before, and it is a great tool but expensive. 11 "O afflicted one, storm-tossed, and not comforted, behold, I will set your stones in antimony, and lay your foundations with sapphires. 12 I will make your pinnacles of agate, your gates of carbuncles, and all your wall of precious stones. 13 All your sons shall be taught by the LORD, and great shall be the prosperity of your sons. 14 In righteousness you shall be established; you shall be far from oppression, for you shall not fear; and from terror, for it shall not come near you.15 If any one stirs up strife, it is not from me; whoever stirs up strife with you shall fall because of you. 16 Behold, I have created the smith who blows the fire of coals, and produces a weapon for its purpose. I have also created the ravager to destroy; 17 no weapon that is fashioned against you shall prosper, and you shall confute every tongue that rises against you in judgment. 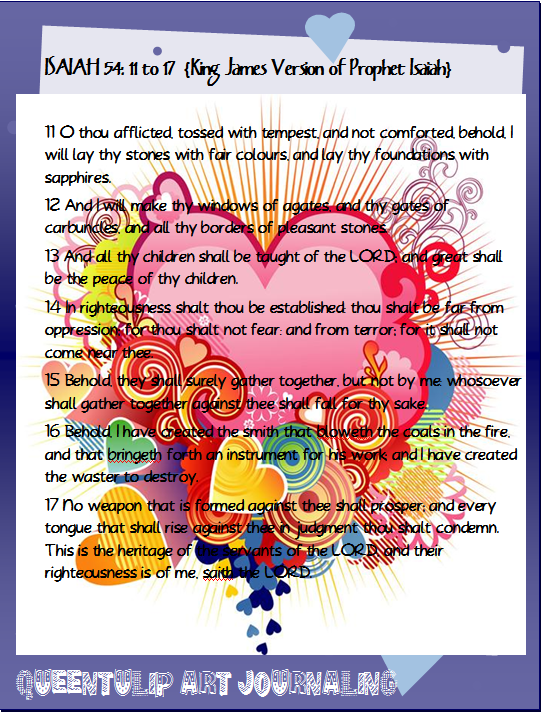 This is the heritage of the servants of the LORD and their vindication from me, says the LORD."